The “Original House of Pizza” was started in Long Beach in 1974. Hilde is German and after about a year, our clientele thought it would be a good idea to change the spelling of “House” to the German spelling “HAUS”. Both words are pronounced the same so why not. 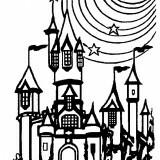 When it came to making a logo, the Haus became a castle. Then one of my engineering buddies liked the circle idea over the castle, we added some stars which later became four, one for each member of the family. The “Haus”, in Long Beach was taken over by the city under the right of eminent domain and we were forced to move. Best thing that ever happened to us, because we found this location in January of 1981. We couldn’t have a better clientele. We thank you for making our business a success.